First post on this blog. This is the place for family, friends and chatter. I hope to keep this spot updated with all my mundane odds and ends, this and thats. And don't be shy! Leave a comment every now and then too. What do you think? Oh yeah, I guess this post will need a pic just to get things started. We got an invitation in the mail today for a very special Birthday Party for a special almost 3 year old girl. 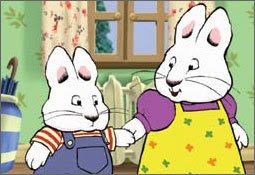 Max and Ruby are invited too! And TaTa says there might be a Worm Cake. Yuck. There will most definitely be a worm cake!! Would you expect any less at a Max & Ruby party?? Oh and that picture is that a view from your home???? No matter what it's beautiful. Yes, it is a summertime view from the deck. Wish it looked that pretty now. How long til spring?